Mount your drink holder either on your handlebars or your clutch or brake perch mounts. 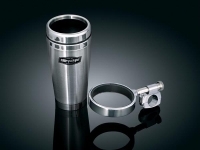 The quick detach thumb screw mount leaves a simple clamp when not in use & allows your beverage to swivel when needed. 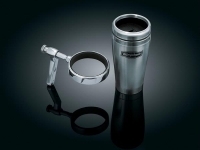 Choose either the Basket Holder or the Stainless Mug with Mounting Ring to hold your beverage. 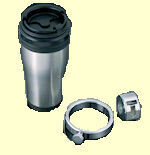 The Universal Basket Holder accepts most average sized cups, cans, bottles & mugs with a 2" to 3-1/2" diameter. Please check P/N on left side for correct order!